In 2012, during a trip in Berlin, Paul beer and bars’ lover, had the idea to create a nightlife guide about the best bars in Paris. Tim approved his idea and YouShould story starts. In 2013, they released the first version of YouShould, a Parisian bar guide, but it’s not as succesfull as it had been hoped. They decide to pivot by becoming a couponing app. Thanks to YouShould you had reductions on your drinks. But again, it’s a failure. In October 2014, they launched the first bar booking platform. Instantly they received a booking enquiry. "We were of course very excited but the party was a total disaster". The bar had forgotten the booking, so 40 people were found alone in the street. They learnt from their mistakes and since that time they are obsessed with one goal : How can they make YouShould the best service to organize the best party ever? 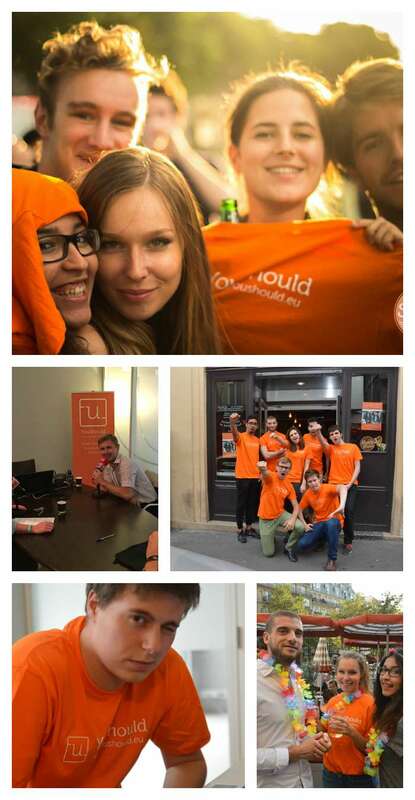 In September 2015, after a long journey, YouShould has become the Bar booking platform leader with 10 cities in France and more than 600 bars on the platform. YouShould couldn’t have come so far without its sympathic and amazing team completely dedicated to the project and our users nights out. Every Thursday the YouShould Afterwork party, is a weekly ritual for the team, which helps build relations and for the team to relax and enjoy. YouShould aims to become the leader of the bar booking platform in Europe, and allow hundreds of thousands of people to party across Europe among friends, colleagues, neighbors, dogs, cats, to be continued. YouShould London is launched during the summer with more than 200 bars in June, and it is just the beginning.